Tetra Tech was the prime contractor for the USDA Forest Service Pacific Southwest Division, to provide a LiDAR dataset with a pulse density of 8 pulses/m2 over the Happy Camp Complex (175 sq. miles), in the Klamath National Forest, California. 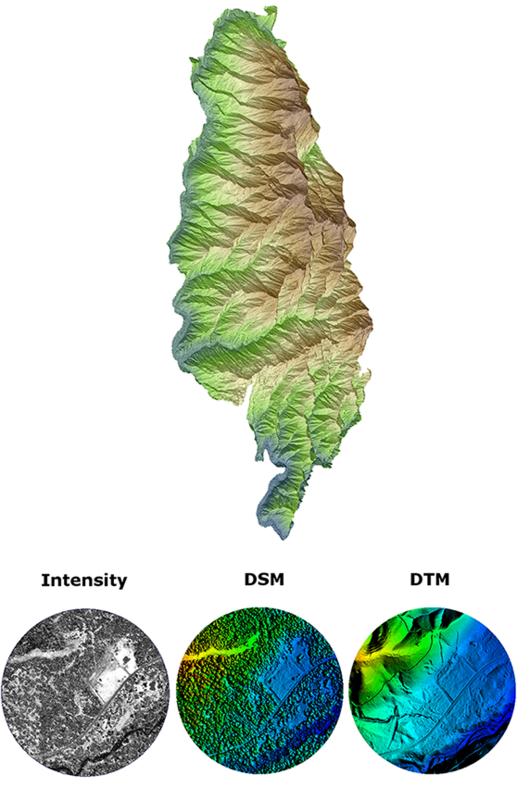 Based on these measure-ments, a Digital Elevation Model (DEM), a Digital Surface Model (DSM) as well as LiDAR intensity images were generated with a 1 meter resolution. The critical challenge was related to the project’s schedule. The goal was to acquire the data before the leaf-on conditions, but at the same time with the highest peaks being free of snow. The project included no less than 334 flight lines acquired in 11 separate flights (7 days), 9.3 billion LiDAR points and 39 ground control points distributed over the study area. The LiDAR point cloud was processed according to a predefined tiling scheme after an initial quality assessment (Coverage, relative and absolute accuracy, point density). The terrain model was extracted with both an unsupervised and a supervised classification procedure. Based on specific subsets of the classified LiDAR points, the elevation grids and the intensity images were generated. Special care was taken to obtain seamless and free of tiling artifacts deliverables. A final quality assessment was undertaken prior to the final products delivery. The data were delivered on an external hard drive, in .las format for the LiDAR point cloud and in ENVI .dat format for the grids and images. Acquisition and ground survey campaign were completed by Towill Surveying. LiDAR processing (Quality assessment, LiDAR classification) and topographic mapping (DEM, DSM, and Intensity Image) were completed by members of the Tetra Tech Geomatic Technologies Group.